Nicole creates and installs fresh flower designs, silk floral arrangements and plants to corporate offices, luxury hotels, restaurants, beauticians, spas and retail boutiques across Glasgow and the west. 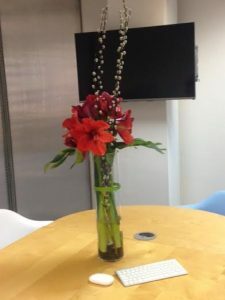 Nicole’s stunning floral arrangements add a splash of colour to any reception, entrance hall or meeting room and present a stylish welcome for your corporate clients, visitors and guests. Nicole’s arrangements are available to buy or to hire. Book a consultation to chat through your requirements and discover the affordable options available to transform your office space into a more inviting working environment.